The City of Fort Lauderdale is situated on the southeast coast of Florida, centrally located between Miami and Palm Beach. Encompassing more than 33 square miles, Ft. Lauderdale is the largest of Broward County's 30 municipalities and the seventh largest city in Florida. Embraced by the Atlantic Ocean, New River and a myriad of scenic inland waterways, Fort Lauderdale truly lives up to its designation as the "Venice of America." This urban oasis city has many luxury real estate properties including condos and traditional homes, and terrific public and private schools. 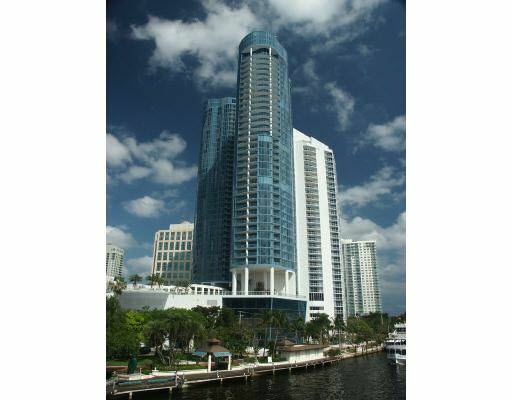 Condo living in Downtown Fort Lauderdale is like nowhere else. The beauty of an exciting city with everything you could possibly want within easy reach is complemented by the architectural diversity and residential luxury in a variety of real estate choices. So enter, escape and enjoy a welcome change of pace in Downtown Fort Lauderdale. It's a wealthy city on the cutting edge of fashion and the arts. It's a beachside community cluttered with sunscreen and souvenirs. Actually, it's both, and it is connected by Las Olas Boulevard and the New River, which makes up the city's "streets-by-water." In addition to the beautiful surroundings, numerous historic sites, museums, chic sidewalk cafés and a 22-block long waterfront walkway all contribute to this city's captivating appeal. Living in downtown Ft. Lauderdale or along Las Olas is awe-inspiring as miles of blue waterways, as inviting as soft golden sands and as soothing as gentle ocean breezes. Downtown Fort Lauderdale is home to numerous luxury condominium complexes that are surrounded by palm trees and feature Ocean, city, intra-coastal, and river views. Life in downtown Fort Lauderdale, Las Olas or along the New River provides an array of luxury condominium and waterfront home choices. Many of these condos are only a short drive from the pristine beaches as well as the chic and contemporary Arts District area. These luxury Fort Lauderdale condo complexes include swimming pools, state-of-the art-fitness centers, spas and entertainment rooms, floor-to-ceiling glass doors and windows, granite countertops in modern European kitchens, and come complete with concierge and valet services. Residents can choose from a number of Downtown Fort Lauderdale Condos such as the NEW 100 Las Olas, the tallest condo in Ft Lauderdale or Las Olas River House, a uniquely designed contemporary condominium situated along the banks of the New River. Other notable condos include: Las Olas Grand, Watergarden, Aria at Las Olas, 45 Hendricks Isle and Venezia also boast the best in Luxury Downtown Fort Lauderdale Condo living. An excellent selection of homes and condos are on the market today, with residences available for sale and for rent. Some popular and prestigious Downtown Fort Lauderdale and Las Olas Waterfront Home Communities catering to boating and yachting enthusiasts include Las Olas Islses, Nurmi Isles, Coral Isles and just south of the downtown area, Rio Vista Isles. Fort Lauderdale also offers an outstanding quality of life, highlighted by a semi-tropical climate, rich natural beauty and array of cultural, entertainment and educational amenities. Blessed with over 3,000 hours of sunshine each year and pleasant year-round ocean breezes, world-famous Fort Lauderdale Beach offers premier opportunities for recreation, relaxation and enjoyment. There are dozens of stores, restaurants, bars and rental shops along the beach, and they have everything you could possibly need for a day in the surf and sand. Beach Place is a new 100,000 square foot shopping, dining and entertainment complex. The picturesque Riverwalk serves as the cornerstone of the City's arts, science, cultural and historic district which features the Broward Center for the Performing Arts, Museum of Discovery and Science, Museum of Art and Old Fort Lauderdale Village and Museum. Las Olas Boulevard has gained international acclaim as Fort Lauderdale's centerpiece of fashion, fine dining and entertainment. In addition, the City's downtown area is home to Broward Community College, Florida Atlantic University, Florida International University, and the award-winning Broward County Main Library. Fort Lauderdale is also the yachting capital of the East Coast and the home of The International Swimming Hall of Fame. If there is a golfer in your family, there are few better places to go than Fort Lauderdale. There are literally dozens of golf courses all within a short distance of downtown. From shopping to deep-sea fishing, this city truly has it all. Take advantage of Fort Lauderdale’s arts and entertainment; the more you do, the more you’ll marvel. Plan a spa day or a day cruise. Riverfront Cruises or the Water Taxi will have you cruising along Ft. Lauderdale's magnificent Intracoastal Waterway. Meanwhile world-class entertainment and gaming are well within reach. An advantageous economic climate is helping the City of Fort Lauderdale establish itself as a world-class international business center and one of the most desirable locations for new, expanding or relocating businesses. Fort Lauderdale is located on Florida’s Gold Coast and is easily accessible via the Fort Lauderdale-Hollywood International Airport. This wonderful boating and yachting community is known best for its amazing white sandy beaches along the Atlantic Ocean. You will also find that many of the residences here are located on a series of canals that open right into the ocean, making Fort Lauderdale unique in its structure. Waterfront living and downtown contemporary elegance has never been more inviting and intriguing. Fort Lauderdale is a great place to live, work and raise a family, and the City looks forward to continuing to build upon its success to meet the challenges of the 21st Century and beyond. Transform your quality of life with a Fort Lauderdale real estate condo or home!